We all enjoyed some entertaining dialogue together, while listening to a collection of songs from various contestants through the season. In addition, the winner, Lee DeWyze, joined us for an interview. 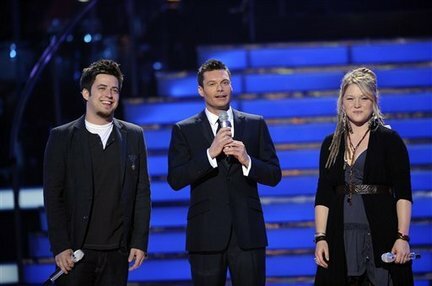 This Maya’s Mix is dedicated to my friend Jayne, since we had fun watching American Idol together this season! This entry was posted on Friday, May 28th, 2010 at 7:51 pm. You can follow any responses to this entry through the RSS 2.0 feed. Both comments and pings are currently closed. oh, what fun! wish i had caught this one. you do the best shows! Aw, thanks for the support! Yeah, it was fun with my co-hosts, and Simon was a hoot. You can still listen to the recording anytime (posted on this blog entry).